The BioPulser® has been designed to permit the drumming of muscles so they vibrate at their natural resonant frequencies thus producing a moderate stimulation which soothes them to relax while simultaneously avoiding over-stimulation which would excite them to contract. 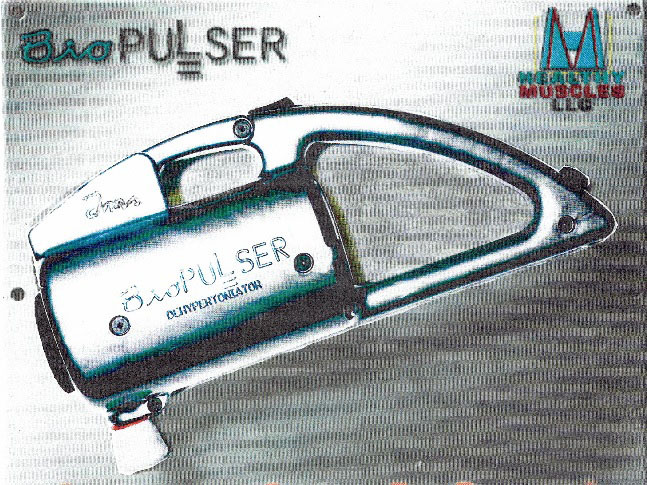 The BioPulser® was made to be the major component of Kanon hypertonic muscle correction protocol but can also be used alone as a "first-aid" device. As a complement to the BioPulser®, the compatible finger-tip "surfing" (manipulation of the muscle surface layers only) technique also stimulates without exciting the muscles. This moderate rocking stroke is described in "What's Really Wrong With You?" p 146. Please note that the Neurosoma technique and Brian Bronk's Advanced Muscle Reconditioning is not Kanon Neurocybernetics.